MAWC nest box designs are a good choice for Madrean Sky Island cavity-nesting birds. Cavity nesting birds need tree cavities that have been drilled out by woodpeckers or other animals. When there is a shortage of trees or none at all, providing these homes gives birds a vital life line. 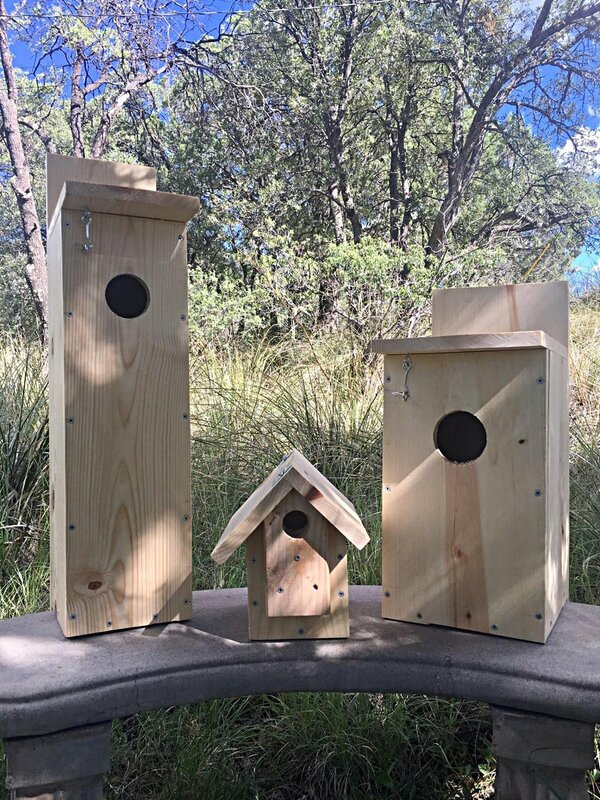 The dimensions were custom-built to attract the correct birds to each box. All boxes are designed with a latch that opens the roof for ease of viewing the nestlings. Predator guard on the Song Bird Nest Box entrance hole provides protection from gnawing rodents and hammering birds. The generous roof design provides shade and protection from the summer heat and monsoon storms. We recommend an application of a light colored water based stain before mounting. We like to use a soft turquoise or jade green. The pine wood was selected from sustainably harvested forests (SFI, sustainable forest initiative) and assembled with galvanized screws. We are very grateful for your support! You have just made a big difference in a bird’s life!